A set of helper tools for debugging your BLoCs. 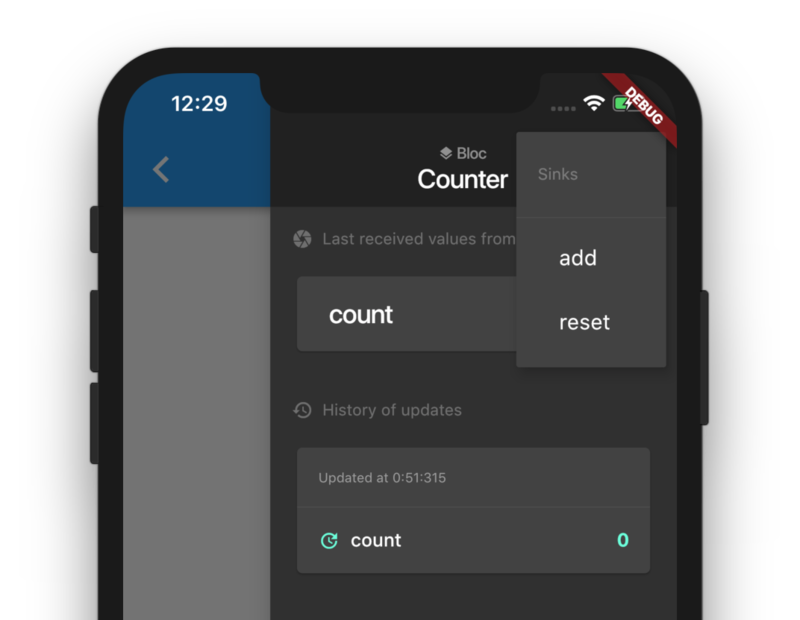 If you start by designing your BLoCs, it can be tedious to test them in real condition (if you have native dependencies and so on), and sometimes you don't have time to create a full set of unit tests for them during your prototyping phase. With BlocDebugger and BlocDebugDrawer, a form is generated to allow you to display all of the Streams values, and to send values to Sinks. If you use my other package built_bloc, all the metadata of a bloc is generated and you simply have to call BlocDebugger.fromMetadata(bloc.metadata, ...). For more detailled examples take a look at the example folder. line 9 col 8: Target of URI doesn't exist: 'package:rxdart/rxdart.dart'. line 45 col 9: Undefined class 'BehaviorSubject'. line 46 col 7: The method 'BehaviorSubject' isn't defined for the class '_BlocDebuggerState'. line 115 col 9: Undefined class 'BehaviorSubject'. line 5 col 8: Unused import: 'package:flutter_bloc_debug/src/widgets/history/entry.dart'. line 16 col 33: Set literals were not supported until version 2.2, but this code is required to be able to run on earlier versions. line 45 col 10: The class 'Future' was not exported from 'dart:core' until version 2.1, but this code is required to be able to run on earlier versions. line 2 col 8: Unused import: 'package:flutter_bloc_debug/src/widgets/history/stream_entry.dart'. A set of debugger tools for developing an app designed with the BLoC pattern.